William and Mary squared off against a ranked Colonial Athletic Association opponent for the second consecutive week when it welcomed 16th-ranked Maine to Zable Stadium for Homecoming Saturday. The College was fresh off a loss to Towson that dropped it below .500 in conference play, while the Black Bears entered the game undefeated in the conference. The Black Bears edged out another ranked CAA team, Rhode Island, last weekend to go to 3-0 in conference on the year. Saturday, with senior wide receiver DeVonte Dedmon, running back Albert Funderburke and sophomore quarterback Shon Mitchell sidelined with injuries, the College overcame the injuries and a slow start to recover and pick up its second CAA victory of the season in a 27-20 upset over the Black Bears. The Black Bears (4-3, 3-1 CAA) got off to a fast start, despite kicking off to start the game. On its first offensive play of the game, the Tribe (3-4, 2-2 CAA) snapped the ball over the head of sophomore quarterback Dean Rotger, and linebacker Sterling Sheffield jumped on the ball in the endzone to give the Black Bears a defensive touchdown and an early 7-0 advantage. The College’s offense got the ball right back on the Black Bears’ second kickoff of the game, but the Tribe failed to pick up a first down and gave quarterback Chris Ferguson and the Black Bears’ offense their first chance to add to their lead. However, the Tribe defense stood tall and forced a three-and-out of its own to give the ball back to Rotger and the offense. Neither team managed to pick up a first down for more than half of the first quarter, until Rotger completed a long pass to junior wide receiver Chris Conlan with just under seven minutes to play in the opening quarter. Conlan outran the Black Bears’ secondary and caught a deep ball from Rotger before getting tripped up inside the five-yard line. Two plays later, sophomore tight end Nick Muse caught a pass in the right corner of the endzone to even the score at 7-7 with 6:09 remaining in the first quarter. Nevertheless, the Black Bears’ offense came to life on their next drive to score their first points of the game, after the defense recovered the fumble to give the Black Bears an early lead. The College’s defense allowed the Black Bears to pick up two first downs and get into the redzone, despite a holding penalty on Maine. However, the Tribe prevented the Black Bears from scoring a touchdown and the Black Bears settled for a field goal by kicker Kenny Doak to retake the lead, 10-7. “All we [the defense] can do is just do our best and try to stop them and this game we were able to stop them,” junior defensive tackle Bill Murray said. At the start of the second quarter, sophomore punter Will Michael was called into action once again and only managed to get off a 26-yard punt under heavy pressure. The Black Bears took advantage of good starting field position at their own 48-yard line and got into the redzone for the second time. However, Ferguson’s pass on third down was tipped by Murray and picked off by junior lineback Arman Jones. Jones streaked down the right sideline all the way to endzone for a pick-six. Junior kicker Kris Hooper added the extra point to give the Tribe its first lead of the game, 14-10 with 13:19 left in the first half. Jones’ return was the Tribe’s first pick-six since the 2016 season against Delaware and the 90-yard return tied for the third longest interception return for a touchdown in Tribe football history. Both teams proceeded to trade three-and-outs, before the Black Bears came up with a third down conversion to put Maine into Tribe territory at the 44-yard line with just under nine minutes to play in the second quarter. The Black Bears failed to pick up another first down and lined up in a punt formation on fourth down at the 36-yard line, but they faked the punt and picked up a first down to extend the drive. Two plays later, running back Ramon Jefferson dashed into the endzone for a 24-yard touchdown to help the Black Bears regain a 17-14 advantage with exactly six minutes remaining in the half. Sophomore quarterback Ted Hefter entered the game for Rotger in the second quarter after Rotger suffered an arm injury. On the last drive of the first half, the Tribe picked up three first downs, but Hefter fumbled inside the 2-yard line to end the College’s chance at taking the lead going into halftime. Neither team was able to come up with points on the first drives of the second half, but the Black Bears got the ball with good field position at their own 41-yard line for their second drive of the third quarter. With just over nine minutes remaining in the third quarter, the Black Bears were forced to punt after not being able to take advantage of their favorable starting field position. The College started its third drive of the half with a 43-yard pass from Hefter to Muse to set the Tribe up just outside of the redzone, looking to reclaim the lead towards the end of the third quarter. However, the Tribe only picked up two more yards after Muse’s long grab to start the drive. After struggling to convert on field goals and extra points last week, junior kicker Kris Hooper split the uprights with a 36-yard attempt to knot the score at 17 with 5:31 to play in the third quarter. The Black Bears were threatening to retake their three-point advantage, but an unsportsmanlike conduct penalty forced them into a long field goal attempt that came up well short, keeping the game tied 17-17 with just over two minutes left in the quarter. At the end of the third quarter and into the start of the fourth quarter, the College started to drive again looking to break the tie with the Black Bears. The Tribe picked up three first downs on a methodical drive before striking a big blow on Hefter’s touchdown throw to junior wide receiver Jalen Christian for 30 yards. With that touchdown, the College took a 24-17 advantage, its largest lead of the game. The touchdown throw from Hefter was his first career touchdown pass for the Tribe. The Black Bears got the ball back after the touchdown with 14:17 remaining in the game. After picking up one first down, Ferguson threw his second interception of the game. Senior linebacker Josh Dulaney stepped in front of the pass to grab the interception and set the Tribe offense up in plus-territory. “I thought defensively we played lights out,” Laycock said. The College was unable to score another touchdown, but Hooper drilled his second field goal of the game despite only making two of six attempts coming into the day. The 37-yard field goal gave the Tribe a two-possession lead, 27-17, which was the largest lead of the afternoon thus far. The College prevented the Black Bears from scoring a touchdown on their next drive, but they still managed to convert on a field goal attempt to cut the deficit to just seven points. The Tribe’s offense was unable to run much clock and the Black Bears got the ball back with a chance to tie the game with under six minutes left. Their drive started at the College’s 45-yard line after a 13-yard punt return. Despite the good field position, the Black Bears failed to convert on a key third down with Murray breaking through to sack Ferguson and force the Black Bears to punt. The Tribe took over with 3:36 left in the game at its own one-yard line. The College could not run the clock out and a short punt by Michael gave the ball to Black Bears at the Tribe’s 36-yard line for a potential game-tying drive. The College forced the Black Bears into a fourth down and Ferguson scrambled to his right and tried to throw for the first down, but the pass was deflected and picked off by junior safety Isaiah Laster. With less than two minutes remaining, the Tribe was able to run the clock out and claim a 27-20 victory over the Black Bears. “Obviously, it was a very special win,” Laycock said. The College was led by Muse’s 107 yards on eight receptions for one touchdown. After Rotger started the game, Hefter went 12-27 through the air for 170 yards and one score. Hooper converted on all three extra point attempts and two field goals. The Black Bears were led in the loss by wide receiver Earnest Edwards’ 196 yards on nine catches. Ferguson was 26-46 for 278 yards but he also threw three interceptions. Next week, the College will travel to Rhode Island for its final game before the bye week. The Tribe’s game against the Rams will start at 12 p.m. Oct. 27. 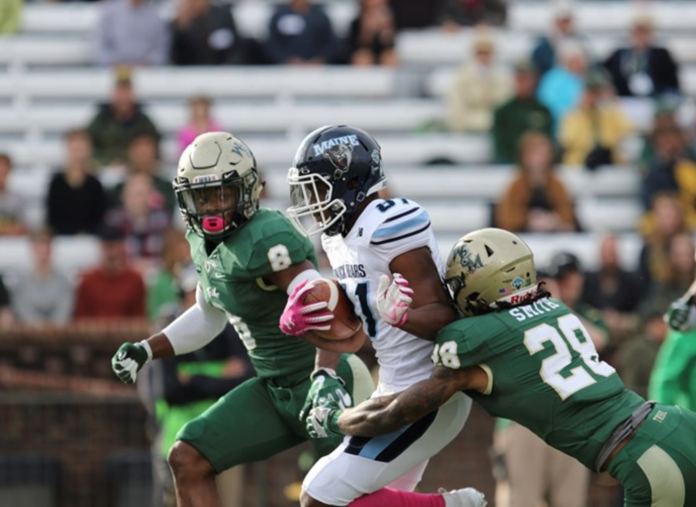 The College last played Rhode Island in 2013, when it blanked the Rams, 20-0 in Williamsburg.